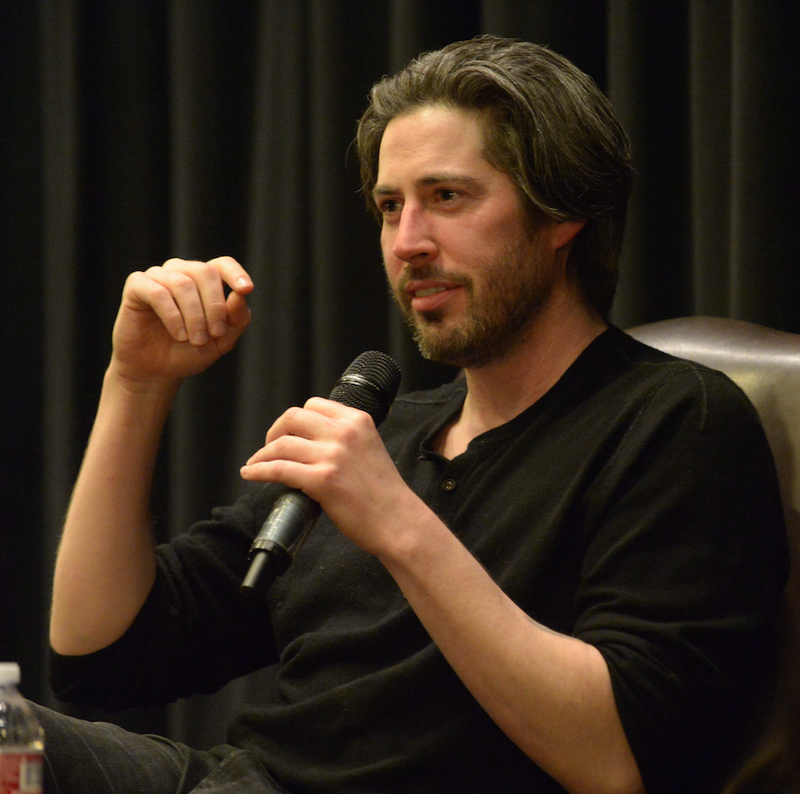 Alum Jason Reitman spoke to students at the USC School of Cinematic Arts after a screening of his 2009 film Up in the Air on April 5th in the Ray Stark Family Theatre. The talk was sponsored by USC Comedy at the School of Cinematic Ars, the Writing for Screen & Television’s Writing Presents Speaker Series, and Movies We Love. The Q & A was hosted by USC alum and screenwriter Tim Dowling. Rietman chose Up in the Air to screen for students because he felt it demonstrated the art and spirit of what it means do things the right way instead of the easy way. In particular, he spoke about how the film took seven years of writing (with other films in between), the tough decision not to “fake” any of the locations—which led to filming in Saint Louis, Miami, Las Vegas, Detroit, and just about everywhere else the film needed—and how to find the movies you are supposed to write. Up in the Air is an adaptation of a novel by Walter Kim that tells the story of Ryan Bingham, a professional employment termination engineer who flies around the country more than three quarters of the year firing people. To get the authentic feel of the various cities visited in the book, Reitman was adamant that they needed to travel, and he told the students that one of the biggest struggles he faced in the production of the film was convincing his producers to let him film on actual locations. “[The producers] were big time trying to get me to ‘go shoot in Vancouver’ and do this film in one city,” said Reitman. “I pushed back hard. We can't shoot this in one place. It's the landscape and the weather and everything. How do you shoot the Miami sequence? How do you shoot Detroit? This thing has to look real." Reitman fought and won for the unique situation of filming in different locations for the film. He credits it for the authentic feel of Up in the Air as well as keeping the general mood of the book intact. Reitman also spoke about his unique upbringing as the son of iconic director Ivan Reitman (Meatballs, Ghostbusters) and how he originally had too much pride to go into directing and follow his father’s footsteps. He began as a pre-med major until his father sat him down after one semester and told him that he needed to find something with more magic to be truly happy—he needed to go into the entertainment industry. Ivan Reitman was a producer on Up in the Air. Reitman also talked about the process of writing Up in the Air for seven years, taking breaks to make Thank You for Smoking and Juno. Moderator and alum Tim Dowling knew Reitman from their days as USC students and shared how being around at the same time formed both of them as artists. Up in the Air is an auteur-led passion project, and Reitman left students with advice on how to have a healthy career and follow their passion. “You have to feel out what type of filmmaker you’re a fan of versus the type of filmmaker that you are,” said Reitman. “I remember thinking while I was [at USC] that I was gonna do horror. A sci-fi film. An action film. I realized later that I'm a fan of those type of films but shouldn't be making them. Part of being an artist is about finding your voice—who you are. I have this realization in every film."